passage in Harrison County last month. For decades, explorers crawling through the vast limestone caverns beneath Corydon, Ind., hit dead ends when trying to connect two well-known caves. But earlier this year, they had a breakthrough — finding a passageway linking Binkley Cave and Blowing Hole Cave, a spectacular uncharted section with tall cathedral-like caverns and an array of limestone formations. The cool factor multiplied when the cavers with the Indiana Speleological Survey realized that by adding the seven-mile Blowing Hole Cave to Binkley, they'd unearthed a combined cavern that is now the 11th longest nationally, at nearly 35 miles. That's big in caving circles, said Arthur Palmer, a retired hydrology professor at the State University of New York who explored Binkley in the 1960s with an Indiana University team. "People all over are interested in what's happening at Binkley," Palmer said, because "it's kind of rare for a cave to undergo a big (growth) spurt like this, especially when it's been explored for so many years." There are far bigger caves. Mammoth Cave near Cave City, Ky., is the world's longest at 390 miles, with Jewel Cave in Custer County, S.D., second at 157 miles. But Binkley's growth "goes beyond exciting to incredible," said Julian "Jerry" Lewis, a biologist from Borden, Ind., who has worked inside the cave on groundwater and wildlife studies. "They keep finding more and more and more" territory, Lewis said. "The potential for it to become more immense is growing by the day." Harrison County is part of a large area of Indiana with karst terrain — meaning it contains deep sinkholes and underground caves and streams. The Hoosier region is similar to porous landscapes found in Kentucky's cave country and central Illinois. Underlaid by limestone, the bedrock has been eaten away by water to form a honeycomb of sinkholes, caves, streams and springs. As with Mammoth Cave in Kentucky, Indiana's caves are a big tourist attraction, drawing more than 80,000 visitors annually to places like Marengo Cave in Crawford County and Squire Boone Caverns in southern Harrison County. But the Binkley and Blowing Hole caves are accessible only via private land, said Jim Hash, an Indiana conservation officer in Harrison County. Since the late 1960s, a band of diehards has mapped and documented Binkley's passageways and large rooms, venturing into muddy, water-filled passages that make exploration very difficult. "Indiana is known for its mud. It's very wet and muddy," and caving involves a lot of difficult crawls, said Patricia Kambesis, an instructor of cave mapping and cartography at Western Kentucky University. 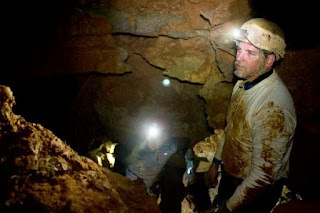 For example, in a March excursion in the Binkley area, cavers Rand Heazlitt of Harrison County and Indianapolis resident Tim McClain crawled through a torturously small twisting tunnel for 250 feet, and then had to rappel 40 feet under a waterfall into a high-domed room. Then they had to scale a 35-foot wall to reach another opening near the ceiling. Over the last 18 months, cavers from Corydon, Bloomington and other nearby areas made dozens of trips into Binkley to refine maps and search again for a Binkley-Blowing Hole connection. With each push into new territory, they posted their findings on a group website. One clue emerged in September 2010, when cousins Tim Pride and Shane Myles of Oakland City spotted a tunnel, or lead, high inside a large room at Binkley that led toward Blowing Hole. The two erected a makeshift ladder — called a scaling pole — and climbed to the opening. From there, they found a previously unexplored larger passageway with a stream running through it. After mapping it on return trips, they realized the water and air currents were flowing toward Blowing Hole. In February, Heazlitt, McClain and Brad Barcom, also of Indianapolis, met one Saturday morning in Corydon with six others for a daylong operation. Packing air horns, white dye, smoke bombs and radios, they sent two teams into separate ends of the caves while a third party stayed on the surface to track the progress. Heazlitt's group inside Binkley traveled down a passageway with water flowing on the floor and hit a "breakdown," or a mound of stone and rock, that was blocking the way. They felt air flowing through the tunnel and, thinking they might be close to the other team, they dropped dye into the water. Although they couldn't hear or see the other team, Heazlitt said, they saw colored smoke rise through rocks. Then they heard an air horn blast somewhere below them. They dug into the rocky breakdown and moved rock until finally they opened a small hole in the floor and found the Blowing Hole team. With each one taking turns reaching through the hole and shaking hands, Heazlitt said, "We were just on top of the world." And they are not finished exploring. "We think we have a chance to get as high as No. 6" in the national rank, with discoveries of new cavernous rooms, said Gary Roberson, a longtime caver who took part in the February trip. Adding 10 miles would push Binkley into the No. 6 spot, held now by 45-mile Friars Hole in West Virginia. The explorations have prompted some survey members to propose development of a new "show" cave that could offer the first public tours of Binkley. Roberson, a former co-owner of Marengo Cave, has approached town and Harrison officials about boring an entrance into Binkley from a 10-acre site south of Corydon. Still, Roberson said, the cavers are aware that despite its vastness, Binkley is fragile and must be protected. "One of the legacies we can leave is to protect the resource," he said.